Livorno, Italy: new piece by Italian artist Gio Pistone for her solo show titled Dana. Diana comes from Latin dius meaning “celestial, bright, shining”. She’s the goddess of the woodlands, the hunt, and the woman; she lives in the forests, accompanied by her dogs. She was called Ecate in hell, either Luna or Febea in heaven, Diana on earth, Artemis in Greece. She had many other names that she was known by in the places she especially honored. She’s portrayed on her deer-drawn chariot, holding a bow, accompanied by a crescent moon. Everything suggests that, in more ancient times, she was identified as the Great Mother. Goddess Diana, in her lunar aspect, was worshiped in the Italian and European tradition’s Stregheria. Wichcraft is a religion that originated long before Christianity. It was a matriarchal and pantheistic worship, in which Diano or Giano stood beside the Great Mother as a symbol of masculine principle. Ritual witchcraft, or the cult of Diana, represents the feminine and the body of the so-called witches, the power of containing and knowing, which is opposed to the typical masculine traits of exclusion and predominance. The concept for the exhibition elaborates on the Goddess figure and develops some fundamental matters of life that are crucial to the witches, priestesses of Diana: Death, Love, Knowledge, Friendship, Envy, and many more. These feelings and stages of human life have always been neglected by science and religion, causing people to look for answers in a variety of fields, among which Witchcraft. 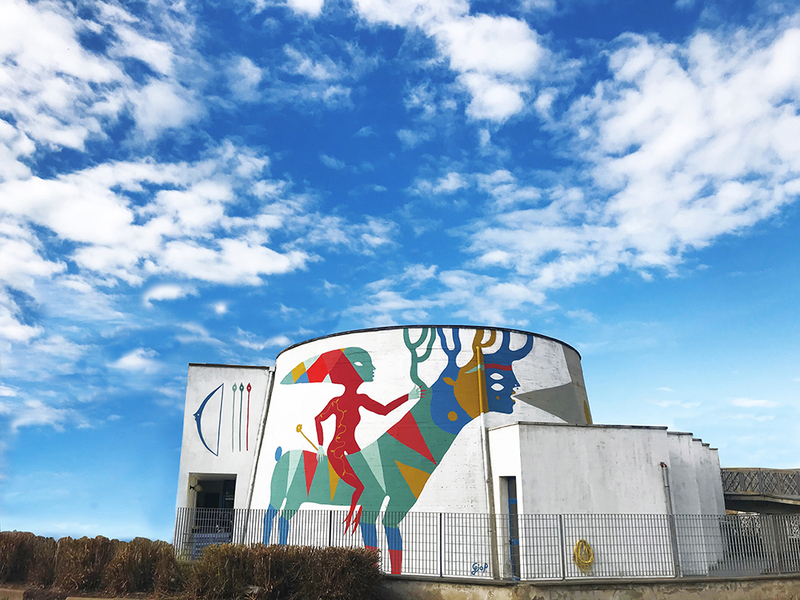 For my mural, I drew my inspiration from the peculiar shape of the building, round and without edges in the upper part, and made up of a mysterious, almost sacred, harmony of straight and curved lines in the lower part. 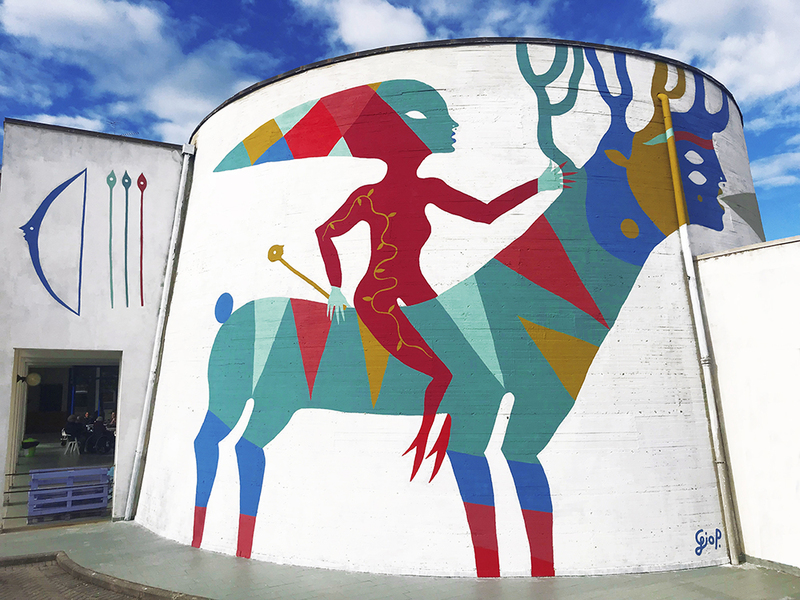 I decided to dedicate my mural to the Goddess Diana (the Goddess of everybody, the Goddess of Diversity: sky, earth, animals, insects, plants, rivers, human species), a symbol, an opportunity to talk about equality, the common good, hospitality.